Get your Formula Ford or Formula Atlantic (Cosworth BDD) back on track with this brand-new engine block from Ford Racing! Using original blueprints and modern techniques perfected over many years casting high-performance engine blocks, Ford has improved the Kent engine block for strength and reliability. This block is a direct replacement for the original 711 Ford Kent engine block, right down to the engine mounting bosses on each side (which the later "next best" 771 Fiesta block does not have). Freeze plugs and camshaft bearings are already installed. Oil gallery plugs, bellhousing dowels, and timing chain rubbing block dowel are included but not installed. Includes main bearing caps, main bearing cap bolts, and specification sheet. Accepts standard size bearings and "uprated" (.516" diameter) lifters, sold separately. "Tall block" 8.20 inch deck height provides a little extra material for decking without exceeding compression ratio limits. SCCA legal for FF1600 per GCR 9.1.1.B.12.b.4. Note 1: The cylinders are left slightly undersize (80.93mm / 3.186") so that you can hone them to your own specifications. This means that final machining is required before use. * All other machining steps have been done. Note 2: A provision for an oil dipstick has been added just in front of the rear main bearing. If you do not use a dipstick, you will need to plug this hole. Dry sump lubrication systems will also need our 15/16" Expansion Plug (Part No.40- 161-61-.9375, sold separately) to plug the crankcase breather port above the fuel pump. Note 3: The center main bearing web on these blocks is machined to accept the full-circle 2.0L Ford (SOHC Pinto) Thrust Washers (Part No.40- 1524, sold separately). This provides more stability and resistance to strong clutch release springs. 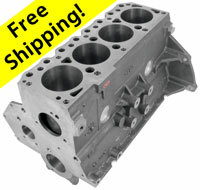 * This block is designed for an 81mm (1600cc) bore size. It can be bored out to a maximum of 83.5mm (1700cc) for non-Formula Ford use. Boring beyond this limit is not recommended, as it will drastically reduce engine life.